Students at Western Governors University use many online systems in the course of their degree programs. Some of these systems work well from mobile phones and tablets, others not so much. PocketWGU was created to make life easier for the mobile student. Originally designed simply to allow students to view current community messages and degree information, PocketWGU has now grown to support a wide range of interactions with the student systems of WGU. 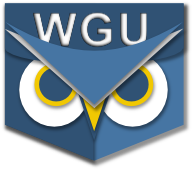 PocketWGU was created entirely by students of WGU for use by students of WGU. It is important to note that WGU does NOT endorse or support this application directly. This is not a product or service of WGU and no affiliation to that excellent institution should be inferred. Also, if you find bugs or problems with this application, they should be reported here (just send us an email); don't bug WGU with requests regarding PocketWGU. With that said, WGU faculty and staff are aware of this effort and the PocketWGU team wishes to express their sincere gratitude for the assistance and enthusiasm provided. Special thanks go out to WGU's IT Department as well as the 2011 Program Manager of Information Technology Programs and the 2011 Chair of the Academic Standards Committee without whom PocketWGU could not exist. Thanks! HTMLAgilityPack under the Ms-PL License. Caliburn.Micro under the MIT License. MyToolkit under the Ms-PL License. JSON.NET under the MIT License. The acknowledgements above do not represent an endorsement of PocketWGU by any party. All products and copyright remain the property of their respective owners. PocketWGU is Copyright (c) 2011-2015, David Bleicher. All rights reserved. Testing: The PocketWGU DevTeam wishes to acknowledge and thank the many students, alumni, faculty and staff who have provided testing and feedback during the development of this application. Their names are not listed here out of respect for their privacy but we, and they, both know who they are. Thank you! I just wanted to stop by and say thank you to my fellow students for helping to make the attending of online classes more mobile! Keep up the good work and I wish I knew enough to help. I am new student and was looking for a easy way to stay connected on my phone. Your app is amazing and thank you for creating it.